Standard 3-component sink came into the shop with drainboards in line with sinks. Customer needed it to be extended and turned into L-shaped table with drainboard at 90 degrees to the first sink. We also fabricated a set of adjustable legs for the extension. ...at once like one customer needed to do. Normal drain pans couldn't cut it so we built one with false sides, sloped bottom and oversized drain hole. Some work isn't pretty in the midst of the work, but we will make it look good for you by the end. Sometimes we invoke the line from the movie "The Best Exotic Marigold Hotel": "In the end, it will be perfect. If it's not perfect, it's not the end." This was part of 48 feet of counter in a restaurant. We sometimes get involved with installations of some stainless work, like a pizza hood extension or a curved stair rail. One of the latest projects was a custom rail for a restaurant's outdoor dining area. Très chic! In the kitchen area, we put in stainless wall panels and all the stainless kitchen work stations. We also built custom perforated stainless steel shelves suspended from the ceiling. Stainless light boxes were built for the light fixtures. We did a blackened steel dining room table for a client...very robust--and remarkable that now everyone who's seen it wants one. Blackening can give the steel almost a beech, mahogany look. We completed a kitchen overhaul for a local church. Tap tower--you know for the premier brewing houses--with a 'zillion' taps/faucets was installed recently at a destination bar and grill in the Twin Cities for their open air/outside/patio bar. Soon you'll see pics of railing we're doing for a restaurant's outside patio area. Here's a kitchen work station that we did recently too. With this will go a twelve-foot custom backsplash to accommodate the cabinetry. 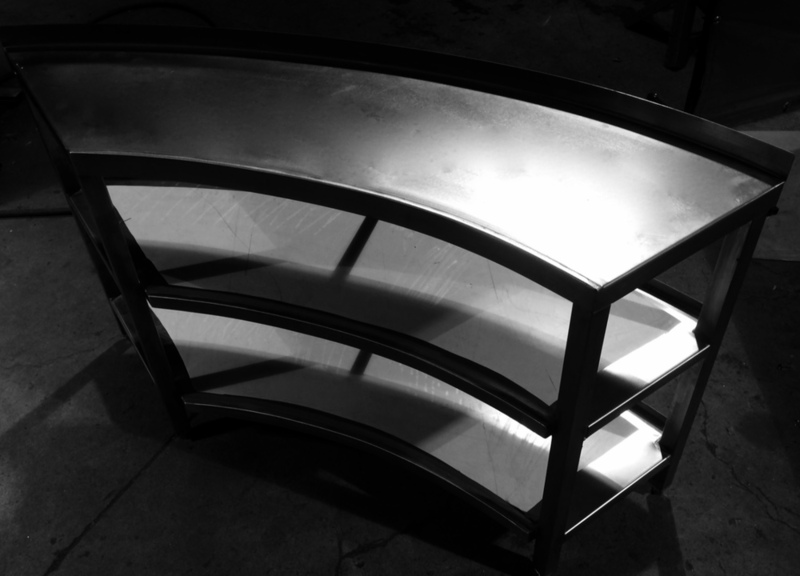 Recent projects asked to modify a stainless table purchased online. No problem! Glad to help! We also upgraded our tortilla maker for a client to make it more robust. We guess it takes a lot of 'oomph' to make tortillas. We build the useful and the aesthetic. Here are some of the latest projects we've built: Custom sprayer booth with rod-style shelves; custom rolling sink; typical ventilation hood (ready for install, protective film still in place). Curved shelf for distillery to fit a specific wall.